My father has this food specialty that when he makes it, it's one huge family affair- his version of adobong baboy. He cooks his adobo in a traditional palayok (clay pot) over wood fire and it takes him hours and hours to make. The lengthy slow cooking process results in a flavorful, aromatic, and impossibly tender pork with almost gelatinous skin. This adobo only gets better when eaten after a day, because by then, all the flavors of the native herbs and spices had gotten the chance to infuse into the pork. My father uses pork belly for his adobo and adds achuete (annatto) and dahon ng bayabas (guava leaves) to the fray. The achuete stains the fat that is rendered from the pork belly producing a bright yellow orange sauce, which I loved for its lingering flavor but hated because it would leave oily yellow stains on the corners of my mouth after I eat it. It's quite unlike your traditional toyo (soy sauce)-based adobo. My father says it's how his family used to make it in Iloilo where he grew up. One thing you should know about my father, there is no arguing with him when it comes to the authenticity of the cuisine he grew up with. I do not miss a lot of pork dishes ever since I stopped eating it, but I admit to missing a few. My father's pork adobo is one of them. That is why I could not help but wonder sometimes how my father's recipe would play out if I used beef instead of pork. 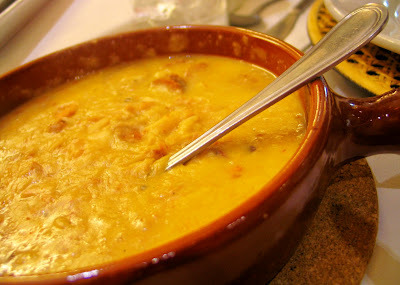 I got my answer when I was introduced to Adobong Batangas by XO46 Bistro Filipino. 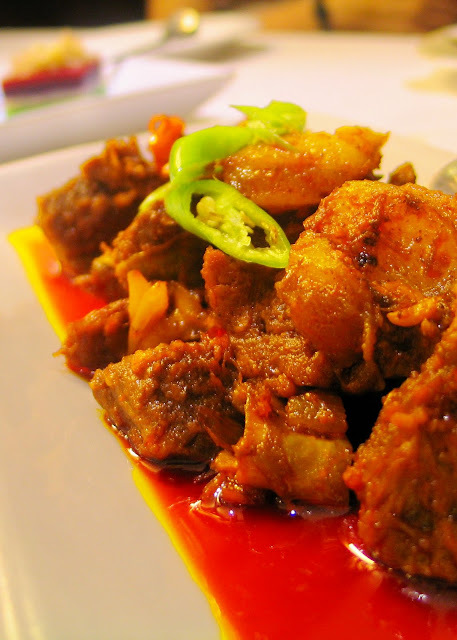 It had the hallmarks of my father's "yellow orange" adobo which made the dish a family favorite, but the good thing about it is that it is made of beef instead of pork. As with my father's adobo, the beef in XO 46's Adobong Batangas is pull-apart tender and worth the extra calories. It simply begs for serving after serving of hot steamed rice. While we waited for our meal at XO 46- Adobong Batangas included- we were served with complimentary puto with aligue (crab fat) butter and sweet butter. Although the combination made me a bit wary at first, I liked the aligue butter. I ended up piling it on with every bite of my puto. 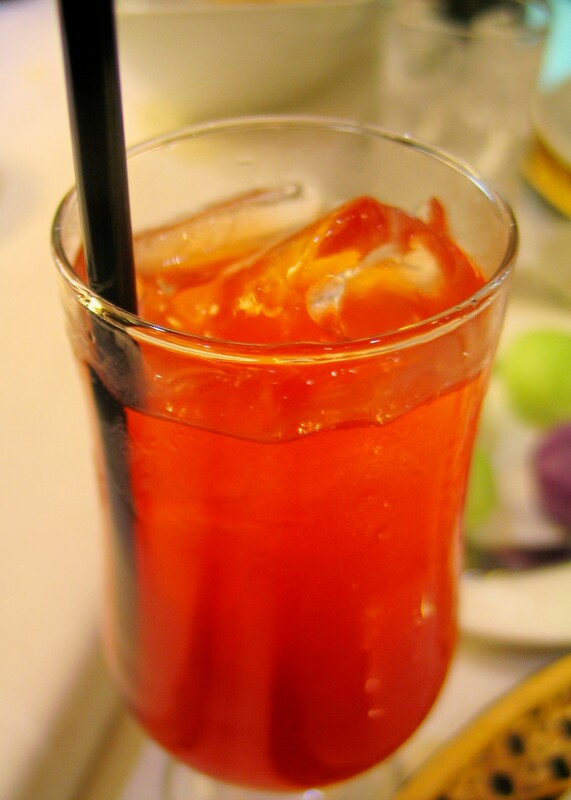 For my drink, I chose Strawberry Salabat (it was a toss-up between that and the Salabat sa Tanglad). Again with the uncanny combination, I know, but I guess the fact that I enjoyed the aligue butter on my puto emboldened me to choose this strawberry and ginger tea. After a swig of my Strawberry Salabat, I decided that it really does pay to be adventurous once in a while. 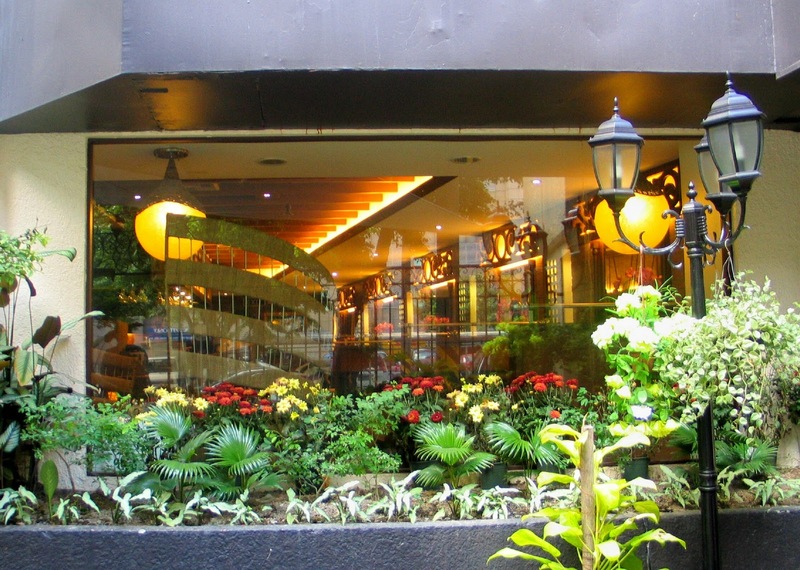 Only two months into operation, XO 46 appears to have earned quite a following in its unassuming little nook almost hidden behind a pocket garden in the middle of the hustle and bustle of the frenetic city that is Makati. Already past 1 in the afternoon, when we arrived, the place was still brimming with lunch-goers. 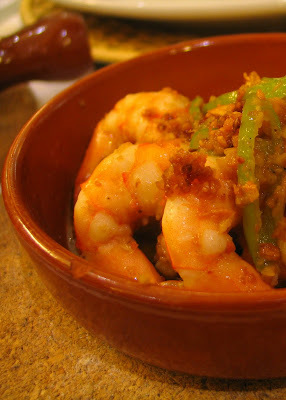 Aside from the Adobong Batangas, the other specialties that we were invited to try out at XO 46 are the Gambas al Ajillo (shrimps with garlic and olive oil) and Fabada de Toledo (stewed white beans with chorizos and pork belly). Both are traditional Filipino-Spanish dishes which are likewise executed very well by XO46 expert chefs headed by executive chef CK Kalaw. For dessert, we were treated to Sapin Sapin and Manticado Jalaya (frozen ube jalaya and leche flan with ice cream). 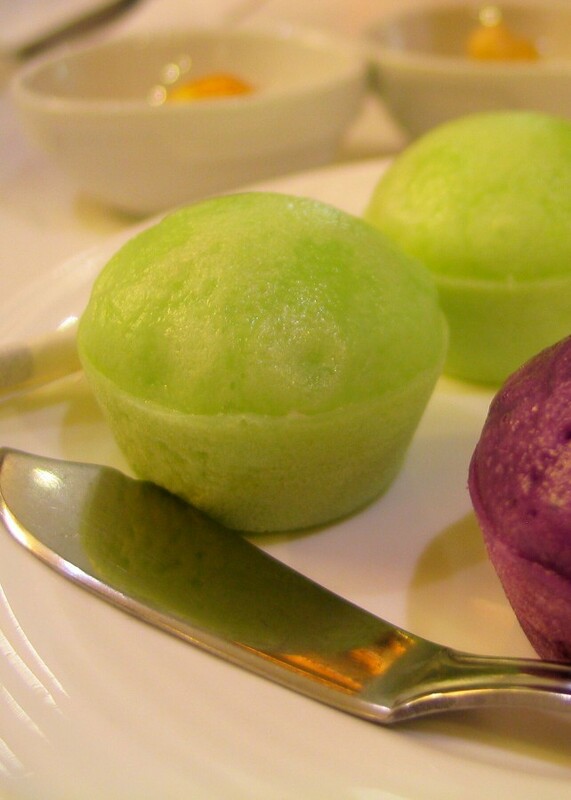 They are of course desserts that the Filipino palate is native to, but with ingenious twists. 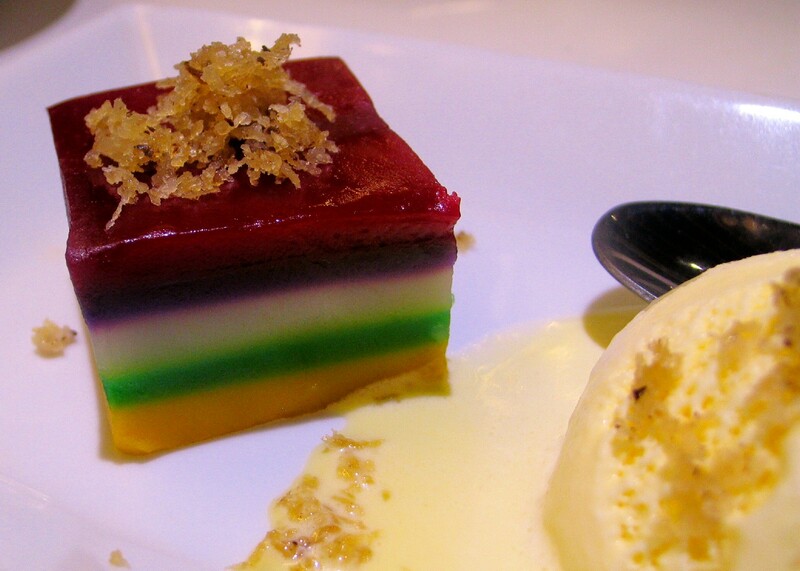 What caught my eye about the XO 46 Sapin Sapin is how neatly piled the colorful layers were. It looked very dainty, and this daintiness translated to the taste of the Sapin Sapin which didn't taste too sweet (an all too usual pitfall of most sapin sapin, in my opinion) just delicately so. For good measure, the XO 46 Sapin Sapin is served with classic Filipino Manticado ice cream. 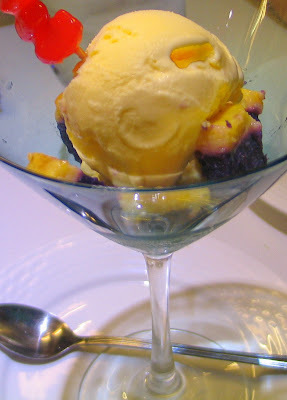 The sweet and slightly bitter cherry-based liquer, which is meant to be poured over the ice cream, gives the otherwise smooth flavored Manticado ice-cream an appealing bite. As with the XO 46 Sapin Sapin, the Manticado Jalaya in XO 46 has its own disarming charm. What is interesting about this particular dessert is the fact that the ube jalaya is fused with a layer of leche flan. This "hybrid" jalaya is served with Manticado ice cream, hence the moniker Manticado Jalaya. 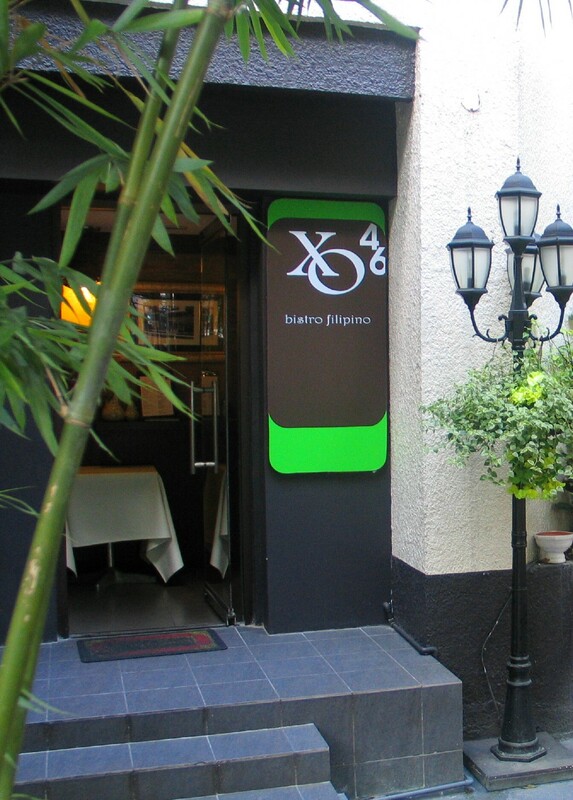 I guess it's no small wonder that the XO in XO 46 stands for extra ordinary. 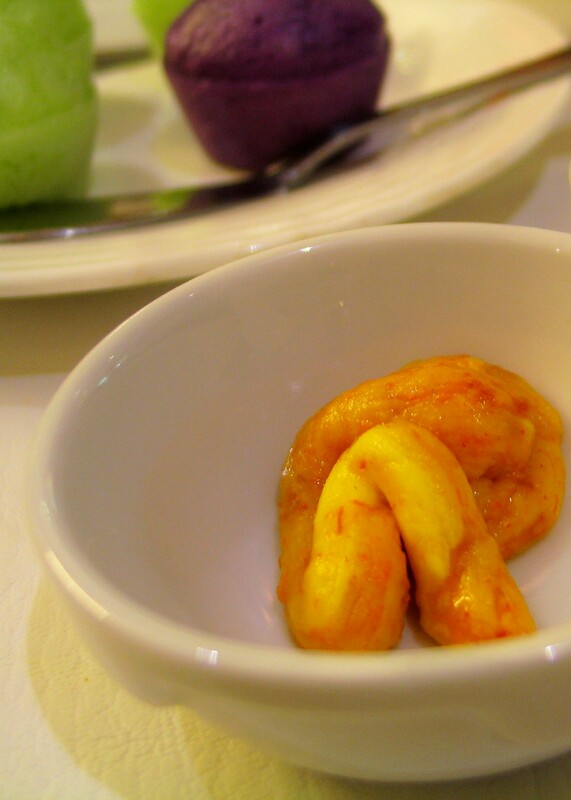 Unique twists like these to Filipino classic cuisine do take quite a bit of extraordinary thinking to get right. Notably, the manticado ice cream is made in-house, which reinforces the impression I get that folks behind XO 46 put a lot of attention to every aspect of their menu. 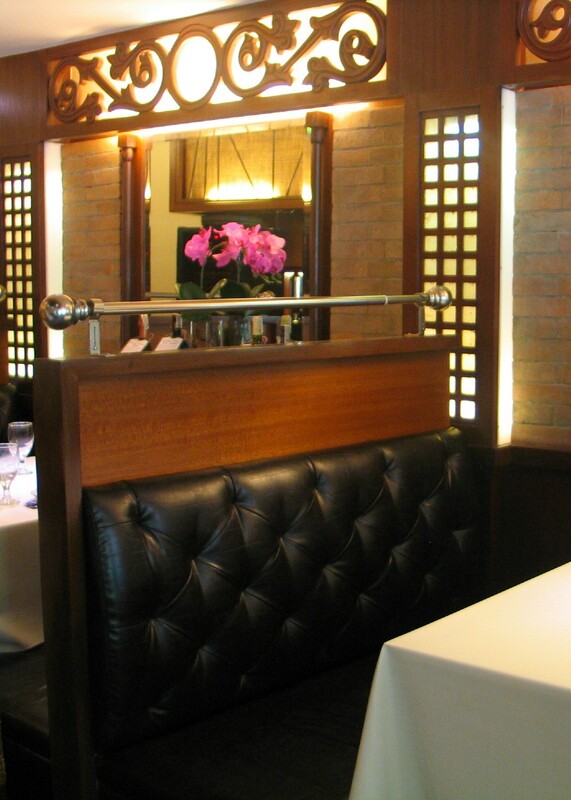 This attention to detail is evident even in the furnishings and the overall ambiance of the restaurant. The chairs and couches are very comfortable (overlooked by a lot of restaurants but is something I treasure in those that ensure that they are). The interior is reminiscent of old Filipino-Spanish architecture, from the wood carvings gilding the ceiling to poignant photographs of Philippine scenes adorning the walls. Oh, and lest I forget, ballads from OPM greats like Rey Valera and Asin, are piped in through the speakers, rounding out the whole traditional Philippine dining experience. 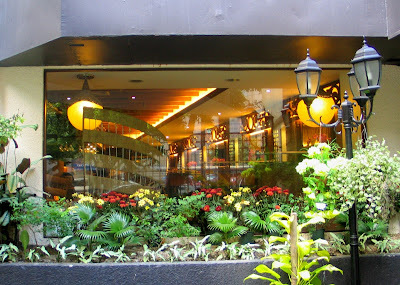 XO 46 Bistro Filipino is located at G/F Le Grand Condominium, 130 Valero Street, Salcedo Village, Makati City. 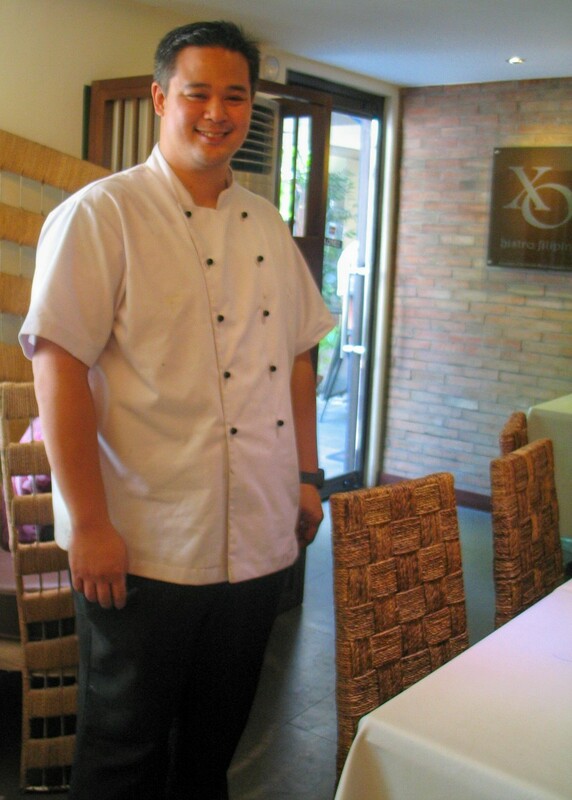 For more information about XO 46 Bistro Filipino, visit its Facebook page at http://www.facebook.com/pages/XO-46-Bistro-Filipino/184146081640792. your post is making me hungry! everything looks so good!